Sutter Home Family Vineyards today announced the 2012 kick-off of the 21st annual Build a Better Burger Recipe contest and cook-off. The contest is now officially open for recipe submissions, closing September 3, 2012. Finalists will compete for the $100,000 grand prize for the winning all-beef burger, and a $15,000 prize for the winning alternative burger. Finalists will be announced the second week of January, 2013 and the cook-off will take place in California’s wine country on May 18, 2013. The winning burgers will be selected by notable chefs and culinary experts. Past judges have included such icons as Iron Chef Cat Cora, Chef/Restaurant owner Thomas Keller, and Celebrity Chef and Restaurateur Art Smith. The judges for the 2012 contest will be announced with the finalists in January 2013. Burgers will be judged on originality, creativity and taste. In addition to King’s Hawaiian and Wholly Guacamole, Sutter Home’s Build a Better Burger sponsors include The National Cattlemen’s Beef Association (NCBA), the national trade association representing U.S. cattle producers; and The California Milk Advisory Board, representing Real California dairy products with the Real California Milk and Real California Cheese seals. 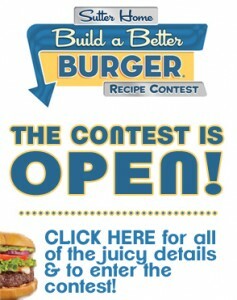 Full rules and details for the contest can be found on the website www.buildabetterburger.com, which will be updated regularly during the contest. Sutter Home Family Vineyards is wholly owned and operated by the Trinchero family, Napa Valley vintners since 1947. Trinchero Family Estates produces more than 28 brands of wine including Sutter Home, Trinchero Napa Valley, Main Street, Napa Cellars, Terra d’Oro, Montevina, Seaglass, Trinity Oaks, Folie à Deux, Ménage à Trois, and the number one alcohol-removed wine, Fre. The company also imports Angove Family Winemakers Australia, Doña Paula wines of Argentina, Carmen wines of Chile and markets and sells the Three Thieves and Joel Gott brands. To learn more visit www.sutterhome.com or www.tfewines.com.